This photo as always intrigued me. My grandmother used to keep it flat in an envelope tucked inside a book on gardening, and for may years it stayed there hidden away on a shelf. After seeing the project 'The Consequences of Vegance' by the photographer Chris Floyd, and my friend Andrew Youngson's recent project 'Soldbuch', I was inspired to dig out the photo and have a proper look. Both projects delve into personal histories of the photographers and their families, relating to the war and events that have shaped them, whilst revisiting the ground where the events took place. I started to realise that the picture showed a moment in time when my own very existence itself had hung in the balance. 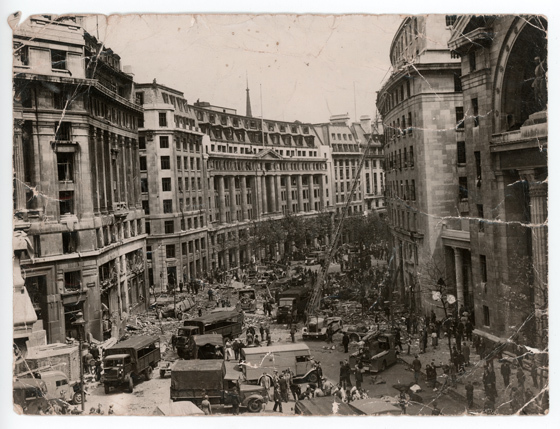 My grandma had been working in a building on Aldwych when the V1 rocket struck. The V1 or to give it its full name the Vergeltungswaffe 1, which translates as 'retaliation weapon', was often referred to in the UK by it's much less threatening nickname, the 'doodlebug'. It was simple, yet deadly; the rocket would run until its fuel ran out and then the engine noise would stop and the bomb would fall. My grandma distinctly remembers hearing the rocket overhead, the buzzing, whining engine and then the deathly anticipation when the engines cut and everyone held their breadth knowing that it was on it's way down. 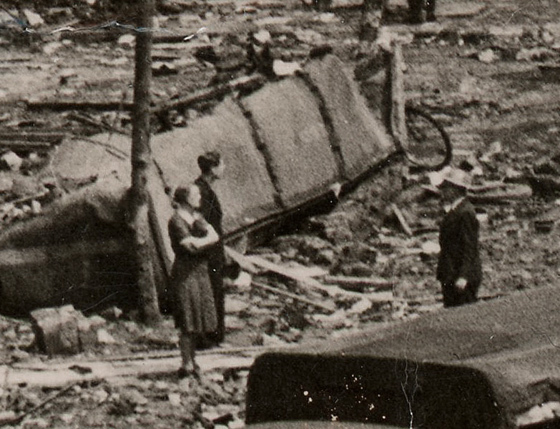 That warning gave her enough time to shelter under a table before the explosion ripped through the building, blowing out windows and sending masonry, glass and debris in every direction. At the time 46 people were reported to have died, but the area was sealed of for a numbers of days, probably in part due to the sensitive ministries and departments caught up in the attack, including the air ministry, the figure of 200 dead is now seen as more realistic. For a number of years whilst studying at the University of Kings College London I walked past the same spot where this bomb struck without ever realising it, nor understanding the significance of that day, and how it could have turned out so very differently. 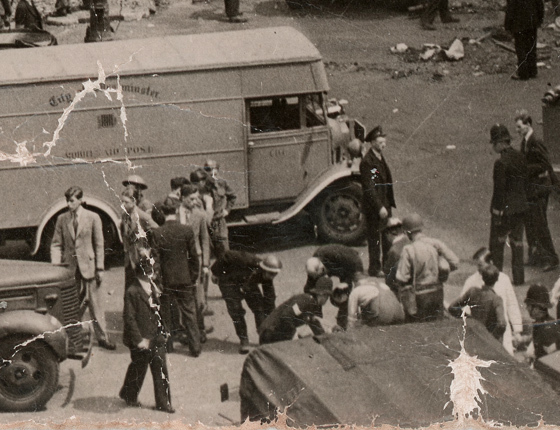 I find the picture itself fascinating and I was reminded of it recently when seeing the riot footage on the television and in the newspapers. There's something about seeing the very heart of urban life so heavily disrupted and thrown out of joint - it makes you realise the fragile nature of society we live in and how quickly and easily things can be turned on their head. It's a picture that seems to hold a thousand different stories. Below are some details from the image. 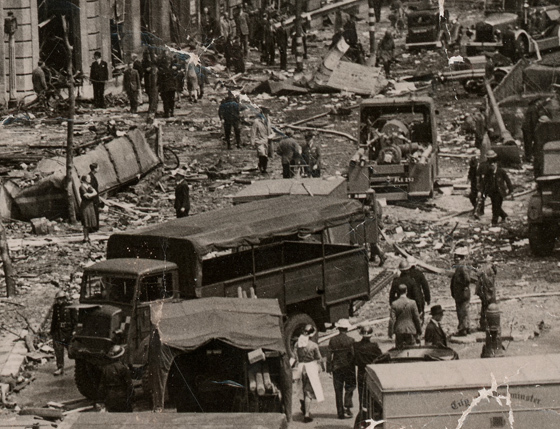 My Father was in the Aldwych, working as a telegram boy for Cable & Wireless when the rocket struck. He was blown along the pavement and covered in dust, but was otherwise unhurt. He was very lucky. Back at the office he was given a strong sweet tea and sent back out to finish his deliveries; no counselling in those days. My aunt Nancy was less fortunate. 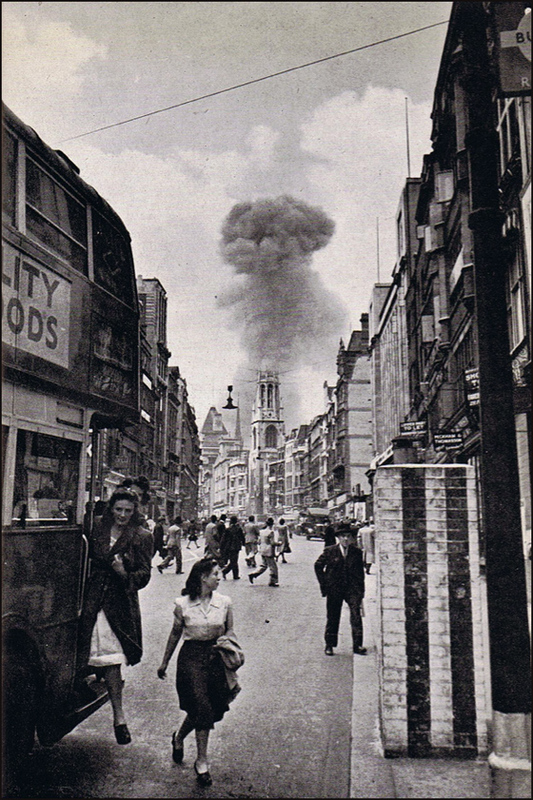 She had been to the LSE to collect her degree certificate, and was on her way home when she was caught in the blast. Just a few minutes earlier, or later, and she would have been unharmed. She was killed instantly, and it was several days before her family in Portsmouth discovered what had happened. 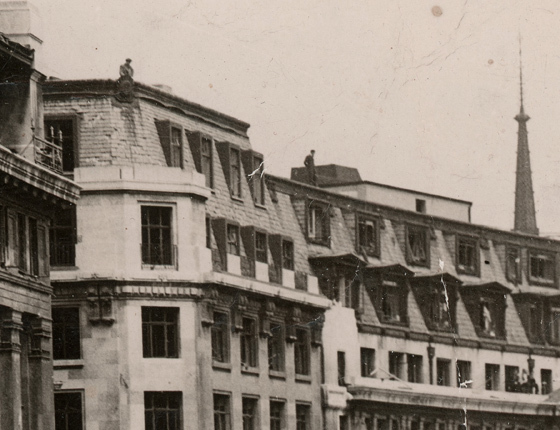 It's still possible to see marks on the walls where the shrapnel dug out chunks of stone, but otherwise there is no hint of the tragedy that took place there. Greg Funnell. Awesome Inc. theme. Powered by Blogger.